Toronto’s Word on the Street. Great weather means an attendance ten times the rain-swept version. Queen’s Park looks perfect with crowds of adults and kids and dogs and tents, prompting the question: why doesn’t the city make more frequent use of this fine, central park? A series of “firsts” for me. The very first public reading from my book, and it takes place in a tent labelled (are you ready?) 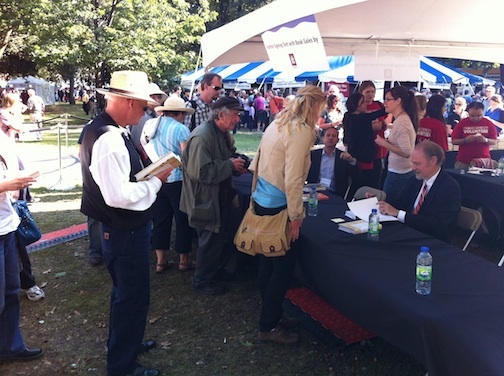 “Vibrant Voices Of Ontario.” The tent is flatteringly full, and Stuart Woods of Quill & Quire introduces me efficiently. I explain that my book is a series of profiles of authors that I edited, but that I’ve chosen to read the book’s Epilogue, “What Happens After My Book Is Published?”, which consists of the Awful Warnings I used to give to first-time authors. As usual, most of the crowd laughs happily at the examples of Murphy’s Law in action – and authors and publishers shake their heads in sad recognition. The second “first” is that, after a “Q and A session,” I am led to the “Authors Signing Tent.” There I shyly sign seven (maybe even eight!) copies, and find myself guiltily resenting the pals who stand at the front of the line to chat, not buy. As the line-up disappears I have time to notice that within twenty metres is the superb black statue of my old friend Al Purdy, characteristically in a relaxed sitting pose, his hair drooping to the very life. I published him at M&S and, in addition to routine, in-office chats, we became friends after I went out to High Park to support him at a sweltering outdoor reading. Backstage, I remember, he was really glad to see me, and we both were bathed in sweat. I hope that the campaign run by Jean Baird to try to preserve his A-frame house in Prince Edward County is going well. I should have done more to help. There’s still time though, and efforts to save the house continue. On November 23, Margaret Atwood is giving a special presentation at Picton’s Regent Theatre. Her provocatively titled presentation “Bulldozing the Mind: The Assault on Cultural and Rural Heritage” follows a reception with Ms. Atwood at Books & Company featuring County food and wine. More details can be found here. This entry was posted in Dispatches from the Road and tagged Al Purdy, Dispatches, Readings, Signings, Tour. I enjoyed your book immensely. I cannot resist editing the consummate editor: on page 98 you refer to Pretty Boy Felson; it was Pretty Boy Bob Felstein. Thanks for the correction. As the copy editor, I’ll take the blame on that one. We’ll be sure to update it for the ebook and future editions.